John Deignan is a solicitor in the Commercial & Business team at Hayes solicitors. 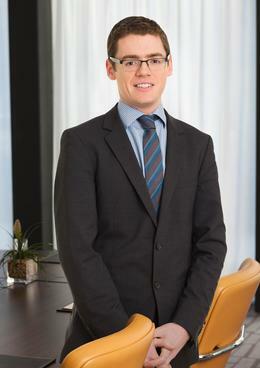 John predominantly specialises in commercial litigation and dispute resolution, and has acted for a wide variety of private companies, State bodies and financial institutions in contract law cases, enforcement and recovery actions, commercial landlord and tenant disputes and defamation actions. These disputes are generally progressed through the High Court or Commercial Court and many are resolved through Alternative Dispute Resolution, such as arbitration and mediation. John also provides advice on a wide range of commercial and business law matters, including the negotiation, review and drafting of commercial contracts, commercial landlord and tenant disputes and data protection law. Civil litigation – Advising on high value and often multi-party commercial claims covering a range of commercial and regulatory issues. Enforcement disputes – represents lenders, private equity funds and receivers in connection with a variety of enforcement disputes, including applications for summary judgment, injunction and vacant possession applications, and receiver applications for directions under s.316 Companies Act 2014, with extensive Commercial Court experience. Commercial Landlord & Tenant – advises both landlords and tenants in commercial landlord and tenant disputes, in particular claims for business equity, long possession equity and improvements equity. Experience of business equity and improvements equity claims going to full hearing. Data protection law – advising companies and State bodies in relation to their data protection obligations under the General Data Protection Regulation. Defamation - experience acting for corporate clients in the defence defamation cases before the Circuit Court and High Court. Experience of defending such actions to full hearing. Personal Injuries - regularly represents the State Claims Agency in respect of Employer/ Public Liability claims. In-house experience – completed secondments in the legal departments of Primark and Pepper Asset Servicing.